Berlin. – In the last week of January an Egyptian doctor has been convicted of the manslaughter of a girl who died after an illegal female genital mutilation procedure. Although Female Genital Mutilation (FGM) was banned in Egypt six years ago, it remains widespread. This proves that criminalizing FGM, meaning prosecution alone cannot end such a deeply- entrenched social and cultural practice. FGM is a violation of human rights, which is practiced worldwide. Up to 140 million women and girls are affected, it is estimated that three million more suffer from the procedure every year. In order to protect girls, a lot more than legal action is needed, claims the German women´s rights NGO TERRE DES FEMMES on the occasion of this year´s International Day of Zero Tolerance to Female Genital Mutilation, that takes place each year on February 6th. Female genital mutilation (FGM) comprises all procedures involving partial or total removal of the female external genitalia or other injury to the female genital organs for non-medical reasons as defined by the World Health Organization (WHO). The WHO estimates that between 100 million and 140 million women and girls worldwide have been subjected to FGM. It has been documented mainly in Africa (in 28 countries), and in a few countries in the Middle East (e.g. Yemen, some Kurdish communities, Saudi Arabia), Asia, especially Indonesia and among certain ethnic groups in Central and South America. Prevalence rates vary between and within countries. TERRE DE FEMMES assumes that the actual numbers are even higher. 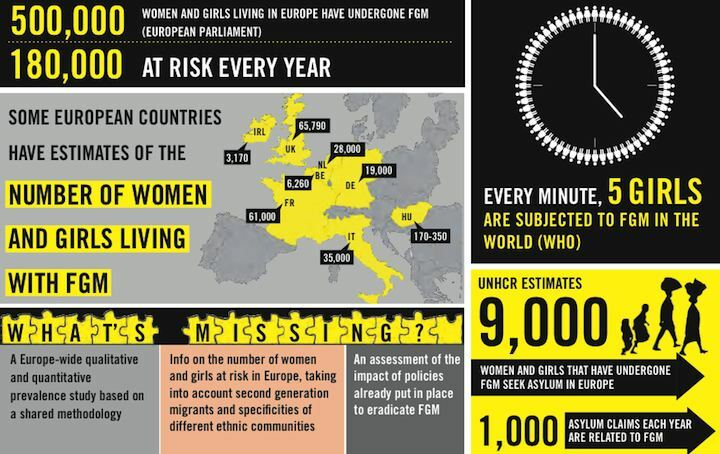 The European Commission and women´s rights organizations estimate that in Europe alone half a million women and girls live with FGM and another 180.000 are threatened to undergo the procedure. Therefore, TERRE DES FEMMES initiated the European CHANGE project two years ago. The European partner organizations are FSAN (Federatie van Somalische Associaties Nederland), the Foundation for Women's Health, Research and Development in the UK, the Euronet-FGM, the Swedish organization RISK and Plan International, which runs the project in Hamburg. With the CHANGE programme, members of African communities are trained to become CHANGE-agents and convince their communities to end FGM. Within the last two years 50 CHANGE-agents realized 150 activities of awareness raising and education about FGM. Glawdys Awo, a trainer of CHANGE-agents from Plan in Hamburg said during the European CHANGE conference, which took place in the last week of January, that trust is a major component of her work within the community. A deeply embedded cultural practice cannot be attacked and abolished within a day. It is a slow process. It is important to involve men and religious leaders to enable meaningful behavioral change. Marie Christine Hanne was born in Mali and lives in Germany for over 30 years. She works as a CHANGE-agent in Hamburg and is part of the programme because “wrong education and bad cultural beliefs are endangering our children. I want to help to achieve that behavior change rather sooner than later.” Hanne explained that the CHANGE-agents take many different approaches in order to reach the women and men in the communities. For one intervention, they even flew in an End-FGM activist from Somalia, who explained why the practice should be abolished. Genital mutilation is a big health-care issue in those African countries, where it is practiced. Women have chronic pain and complications during child birth. Therefore FGM is not only an issue of women´s empowerment, but also a public health problem. The so-called "community empowerment" approach is adapted in many communities in several African countries as well. According to the WHO, it refers to the process of enabling communities to increase control over their lives. The concept goes beyond the involvement, participation or engagement of communities. It implies community ownership and action that explicitly aims at social and political change. Community empowerment is a process of re-negotiating power in order to gain more control. A successful example is given by TERRE DES FEMMES´s partner organization Bangr Nooma in Burkina Faso. Although, FGM is illegal in the West African state, it is still practiced in rural areas. A team from Bangr Nooma goes from village to village and explains the health risks and consequences of FGM to different groups in the communities. According to the organization more than 32.000 girls have so far been spared from mutilation. "Unfortunately, these personnel-intensive projects are least likely to be funded by governments“ said Christa Stolle, CEO of TERRE DES FEMMES. Funding is a problem in Europe as well. It is not sure yet, if the funding of the CHANGE project will be prolonged. There are various reasons for FGM. "The practice is mainly justified by culture", explained Glawdys Awo. FGM aims to control women´s sexuality, to reinforce gender roles as well as cultural identity, specifies the End FGM European Network. In some communities women, who did not undergo FGM are considered “dirty” and are not allowed to handle water and food. Additionally, in most communities FGM is an initiation rite, which implies girls not undergoing FGM are not considered adult women. This reflects a deep-rooted inequality between the sexes and constitutes an extreme form of discrimination against women and girls. According to the UN, the practice also violates the rights to health, security and physical integrity, the right to be free from torture and cruel, inhuman or degrading treatment, and the right to life when the procedure results in death. The FGM activist Waris Dirie is actually optimistic that FGM can be abolished during her lifetime. She is glad about the momentum the topic gained until now. Waris Dirie was one of the first women, who raised public awareness about FGM about 20 years ago. All EU countries have either specific or general laws addressing FGM as a form of gender based violence. Eight European countries have national action plans against FGM. The End FGM Network showcases a few promising European policies realized in Belgium, the Netherlands, Portugal and Italy. What they all have in common is the focus on awareness raising and prevention as well as recognition and engagement of community and grassroots organizations. There are a few states, which consider FGM in asylum claims. There are more and more institutions aiming to help women, who had to undergo FGM. In the United Kingdom there are 15 hospitals specialized in reconstructive surgery. Since September 2013, the Desert Flower Center in Berlin is providing reconstructive surgery and psychological help to women. But without raising awareness and interventions such as the CHANGE programm, these clinics remain empty. End FGM Network: Where fo we stand in Europe? The European Commission Action Plan: "Towards the elimination of female genital mutilation"
Amnesty International and the Council of Europe have released a guide to place female genital mutilation (FGM), high on the political agenda – and to promote the Council of Europe’s Convention on Preventing and Combating Violence against Women and Domestic Violence (Istanbul Convention).